Tom Clancy's Splinter Cell: Pandora Tomorrow is an action-adventure stealth game, developed and published by Ubisoft Shanghai, while Ubisoft Montreal, creator of the original Splinter Cell, was working on Chaos Theory. 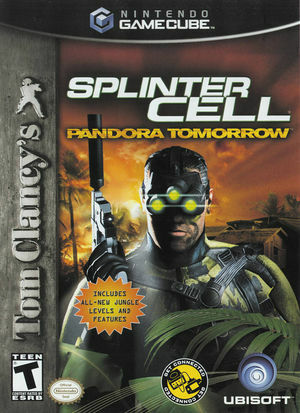 Pandora Tomorrow is the second game in the Splinter Cell series endorsed by writer Tom Clancy. The game follows the covert activities of Sam Fisher, an agent working for a black-ops branch of the National Security Agency (NSA) called "Third Echelon". The character, Sam Fisher, is voiced by Michael Ironside. Dennis Haysbert, at that time best known for his role as David Palmer on the television show 24 is the voice for the character Irving Lambert, Fisher's boss, making this the only time he is not voiced by Don Jordan. Lalo Schifrin provides the theme music for the game. The game has been translated to several languages for international distribution. Pandora Tomorrow was entitled Shadow Strike during its development. Dolphin's aspect ratio detection can sometimes become confused by this title, rapidly swapping between 4:3 and 16:9 modes. Refer issue 9895. Fixed in 5.0-3305. The graph below charts the compatibility with Tom Clancy's Splinter Cell: Pandora Tomorrow since Dolphin's 2.0 release, listing revisions only where a compatibility change occurred. This page was last edited on 16 January 2018, at 04:32.